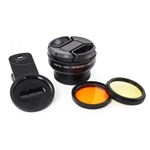 The IceCap Clip-on Photo Lens Kit captures the true beauty of any aquarium with your mobile device using the IceCap Clip-on Lens Kit. Clamps directly over almost any smartphone or tablet's camera to instantly filter out excess blue light from the photo. This allows you to capture and share stunning images of corals the way they appear in person. Get awesome full tank shots with the included wide angle lens and your favorite filter.